You can get the Sony handheld compact from John Lewis at around £70 (with a two-year guarantee) or from Amazon. No niggly wires on show here; the Sony XDR-P1DBP packs in both a proper telescopic aerial for searching out DAB, DAB+ and FM broadcasts (earning the radio a 'digital tick' for its futureproof design in the process), in addition to a mini-USB socket for recharging through a USB plug-in mains charger or computer. 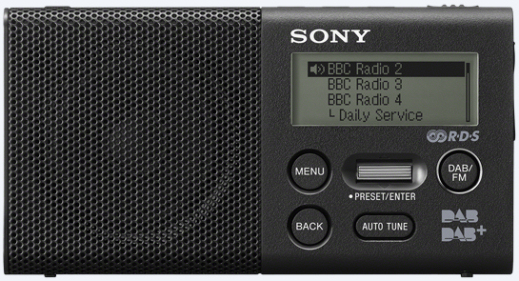 This being a Sony, the receiver is smartly made, with a clear, multi-line display up front and three direct-access preset buttons, for accessing saved favourite stations, along the top of the unit. Separate rocker and up/down switches let you scroll through the station list and change the volume, while a prominent autotune button stops you reaching for the instruction booklet when stations on DAB decide to do a move to a different multiplex without telling you. A combined power and hold/lock button stops you changing channel by accident and the built-in lithium ion battery is good for 15 hours' use at normal levels through the 45mm speaker, or for up to 20 hours via headphones (yes, there is a headphone socket for hook-ups to bigger sound systems or for night-time listening, complete with a programmable sleep timer across 60, 45, 30 or 15 minutes). The amber backlit display (which can be set to turn off to save battery power) displays the station list, with scrolling text information and a low battery indicator. The XDR-P1DBP is a diminutive 115 x 57 x 24.5 mm, but produces a big sound for its size, thanks to a 'digital amplifier', giving it a bit of oomph. 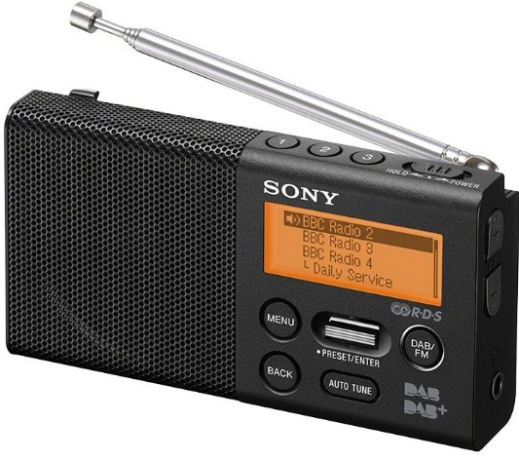 Sony have designed yet another reliable, easy-to-operate DAB radio that you can take out and about, with a built-in rechargeable battery and extending aerial. Check the left-hand column to find out where to get one, for under £70 for the Sony XDR-P1DBP.